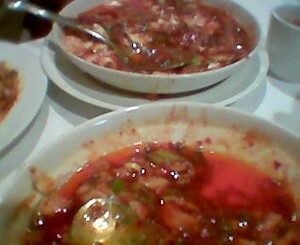 Pig intestines at Grand Sichuan were a lovely treat. Fried crispy, like cracklins, with a nice porky flavor. I have to say that for the money, there were a lot of intestines. Not that I have any barometer for such a thing. It just seemed like a lot. 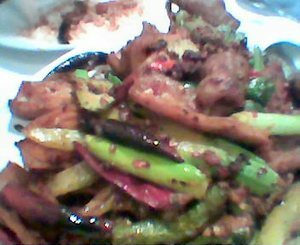 Served with vegetables in a spicy sichuan pepper-kicked sauce. Highly recommended. GS has at any given moment only 2 or 3 different white wines, and sometimes nothing but Chardonnay. WLY has about 5 or 6. Neither have very interesting or Chinese food-appropriate wines to my mind. GS has a decent-enough pinot blanc (when they have it), which is more than I can say for WLY. GS has a much larger menu than WLY. GS's much larger menu can be overwhelming. WLY has much better dan-dan noodle. GS's dishes often come swimming in red oil and you can order several dishes that effectively taste the same if you're not careful (I'm not careful). GS has freshly-killed chicken "not refrigerated long time", which has an interesting texture. No such chicken at WLY. Thank goodness they both exist.